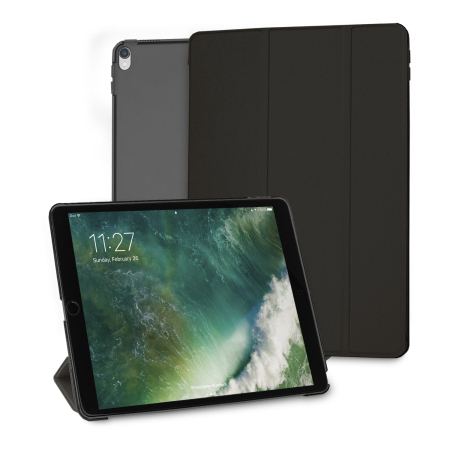 Protect your iPad Pro 10.5 with this supremely functional transparent and black case with viewing stand feature. Also features smart sleep / wake functionality. It doesn’t add any bulk to the iPad and the easy to use stand can be positioned higher or lower. It certainly serves the purpose, a good attractive well fitting case, very well priced, lightweight. My only critisism is that the seal on the cover doesn’t seem to be very secure, a bit of a lightweight magnetic grip compared to the iPad equivalent, but considerably cheaper. I didn’t like the price of the Smart Covers for my Apple iPad Pro 10.5”, so I decided to Search Google for an alternative. I found Mobile Fun and ordered the Olixar Smart Case, which has a clear back to show off my gold coloured iPad, with a gold Smart Cover to match. It fitted perfectly, and I’m very happy with it. Why pay exhorbitant prices, when you can get an excellent cover like Olixar offers, for a fraction of the price. Happy camper. It does what it needs to. It protects my iPad Pro, very easy to use, I'm happy, thank you. Prompt delivery as case needed like yesterday. Wonderful to have secure FOT and very light and slim. Just what I needed. I bought this ipad pro case together with a glass protector. My review of the glass protector was glowing and the same applies to this item. Well done guys! !